Bastille Day is this upcoming Friday, and what better day to celebrate (even as an American) than by eating French food! I'm kind of obsessed with all things French. I have about a million French trinkets and such throughout my home, as well as not one but two Eiffel Tower key-chains hanging from my keys. There are countless French dishes that I enjoy to make and eat, all of which would be perfect for this holiday. You could start with Salmon Rillettes or maybe some classic French Onion Soup. Perhaps one of my favorites, Beef Bourguignon will fit the bill. For dessert you could try Tarte aux Pommes and Chocolat Chaud, or puffy Tea Souffles. Today I'll share another option for a classic French dish to add to the mix. This one hails from Provence, Marseille in particular on the Côte d'Azur. 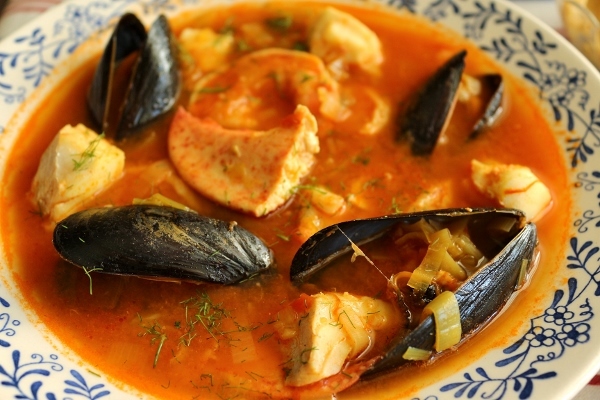 Bouillabaise is a Provençal fish stew with a fragrant broth of onions, leeks, garlic, fennel, tomatoes, and fish stock, enlightened with a bit of saffron and orange zest, and finished with a myriad of seafood. 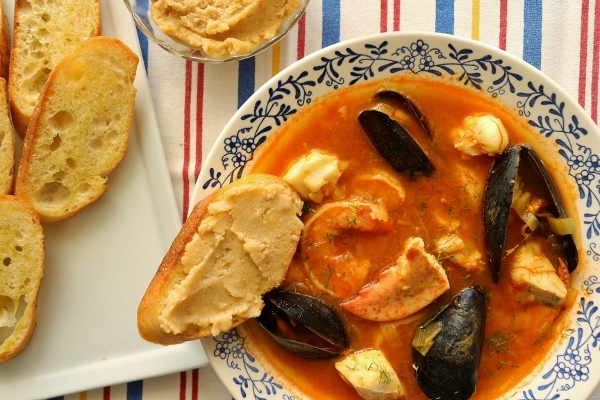 Some recipes strain the aromatics out of the broth before cooking the seafood and serving, but I like the idea of serving a more rustic presentation where you can see all of the ingredients as you eat. You can use quite a selection of seafood here, but I've kept it quite simple with shrimp, mussels, white fish (haddock in my case), and lobster, which is optional and easily omitted if you can't get your hands on one or feel squeamish about cooking them yourself. 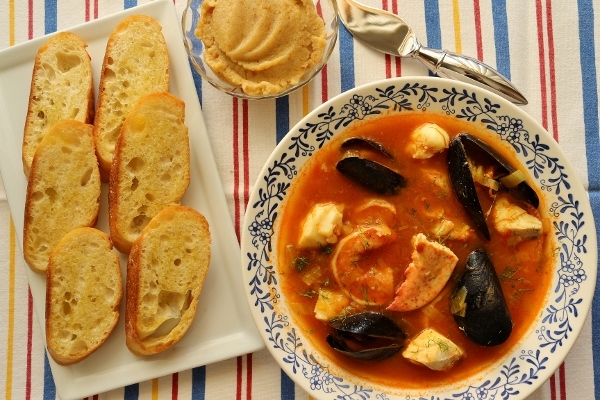 The most time consuming part of making Bouillabaise is prepping the seafood, scrubbing your mussels, peeling and deveining your shrimp, and cleaning your cooked lobster, but otherwise this Bouillabaise is not that complicated to make. 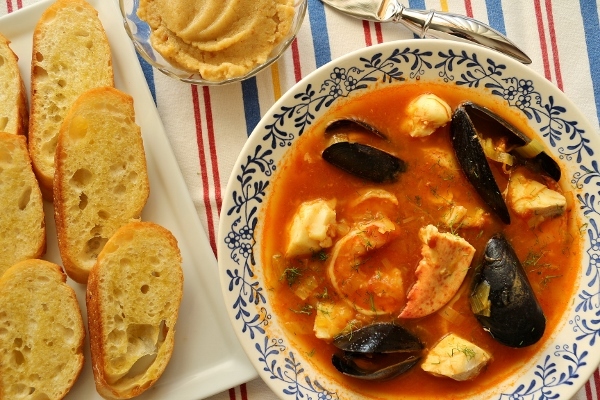 You can even cook the broth ahead of time and then reheat it before adding your seafood last minute for a weeknight dinner. Traditionally served with this glorious stew are toasted baguette croutons (or at least some crusty bread) topped with rouille meaning "rust" in French, a garlicky spread. I've seen a lot of different ways to make rouille. Some feature roasted red bell pepper, others are closer to aioli in preparation, and yet others include bread or breadcrumbs as the base. I adapted a recipe using a chunk of diced baguette as the base, and blitzed it together with garlic, cayenne pepper, and olive oil in a small food processor. It was absolutely divine! 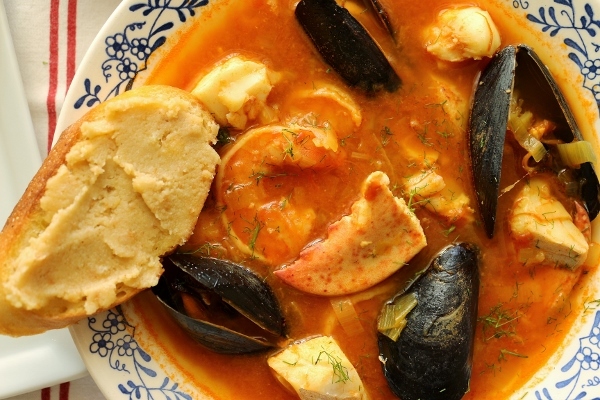 To make the rouille: In a mini food processor, sprinkle the diced bread with the water and let stand until the water is absorbed, about 5 minutes. Add the garlic, cayenne and salt and process until the bread and garlic are coarsely chopped. With the machine on, drizzle in the olive oil and process until the rouille is smooth. 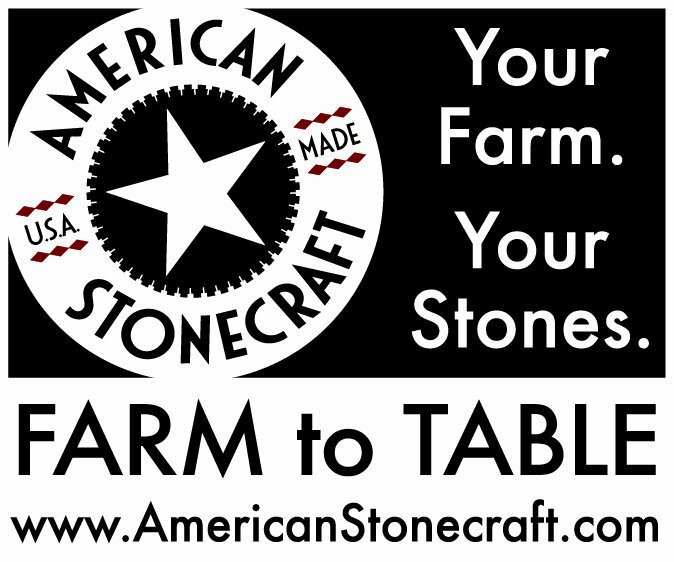 Transfer to a bowl and refrigerate. To make the croutons: Slice the remainder of the baguette on the bias (diagonally) into 1/2-inch thick slices. Put oven rack in middle position and preheat oven to 400°F. Arrange bread slices in 1 layer in a shallow baking pan and brush both sides with oil. Bake until crisp, about 8 minutes. Set aside. 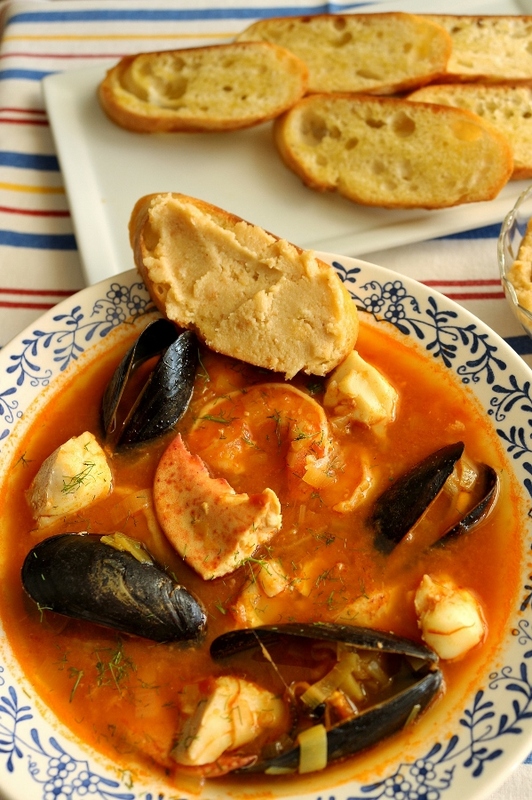 To make the bouillabaise: Cut a large square of cheesecloth, and place the reserved shrimp shells in the middle along with the bay leaf, thyme, and orange zest strips. Tie the cheesecloth into a bundle with kitchen twine. Heat oil in a Dutch oven over medium-high heat. Add onion, leeks, garlic, and fennel, and saute until translucent, about 5 minutes. Add the tomatoes and cook until they begin to break down, about 5 minutes. Add the saffron, white wine, fish stock, and the cheesecloth bundle of shrimp shells and bring to a boil. Season with salt and pepper. Reduce heat to low, cover and simmer until the vegetables are very tender, about 20 minutes. Remove the cheesecloth bundle, holding it over the pot and gently squeezing it with the back of a spoon or a pair of tongs to release all of the juice. If using lobster, very carefully remove rubber bands from the claws (use scissors to snip them). Place the lobster in the pot, cover and cook for 8 minutes (flip the lobster over halfway through if needed, to ensure it's entirely submerged and cooks evenly). Using tongs, remove the lobster, letting any bits from the soup drain back into the pot. Let the lobster cool slightly, and remove meat from the claws and tail, cutting into 1-inch pieces. Season the fish and add it with the mussels to the simmering broth. Cover and cook for 2 minutes. 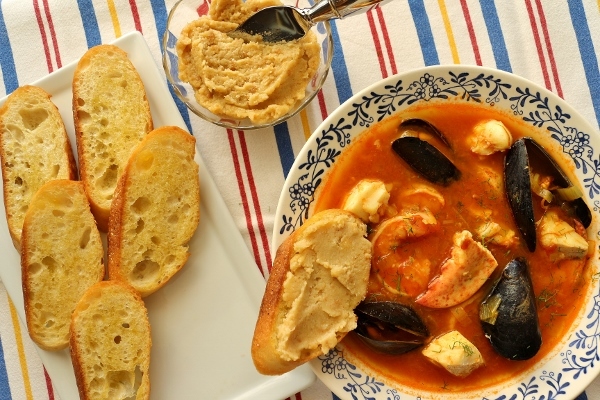 When the mussels start to open, add the shrimp and the cooked lobster meat and finish cooking, covered, until the shrimp is cooked through, and the mussels have fully opened, another minute or two. Discard any mussels that do not open. Adjust seasoning of broth as needed before serving. Ladle into bowls, garnish with chopped fresh fennel fronds, and serve with croutons and rouille on the side.